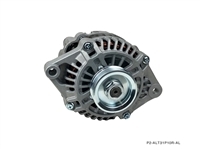 P2M vehicle specific upgraded alternators features upgraded 90 AMP power over conventional factory amperage. Higher amperage were designed to ensure to supply stable voltage to your car's electronics and operational well being. Often times a weak or interrupted power supply can hamper vehicle operational performance.